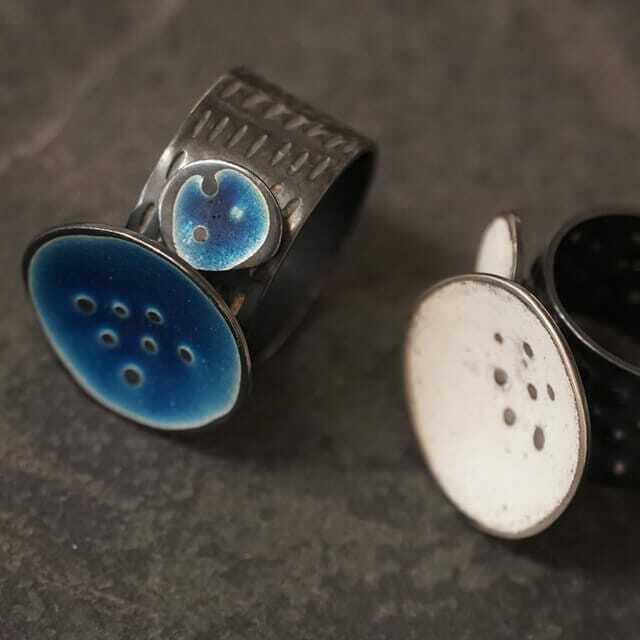 You can’t resist wanting to wear this striking organic jewellery made from oxidised silver. Slide this wonderfully tactile ring on to a finger and enjoy simply caressing its stippled glossy surfaces. The wide ring band is made from oxidised silver embellished with textural marks. It’s topped by a large central disc in a glorious burnt orange hue, with a similar small one set to the side. Both discs are pleasingly irregular circles, satin finished to add a subtle gleam that makes them look good enough to eat (or at least lick). 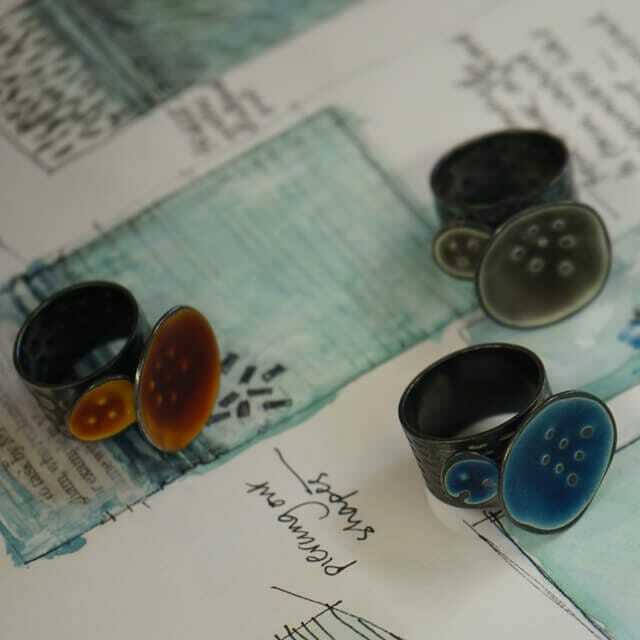 The sea life and textures found on the North Scottish shoreline inspired Caroline to create this ring. Her desire was to echo the symbiotic nature of the local creatures and flora, and evoke seaweed, lichen and rusted iron in the orange enamel details. This ring is made to order to fit you perfectly. Please specify your size in the comments box at the checkout when ordering. Fife-based Caroline is a graduate of Grey's School of Art in Aberdeen in the north of Scotland and has exhibited throughout the UK and in the Netherlands. She taught for many years until hanging up her lecturer's hat in 2013 to concentrate solely on her jewellery work. 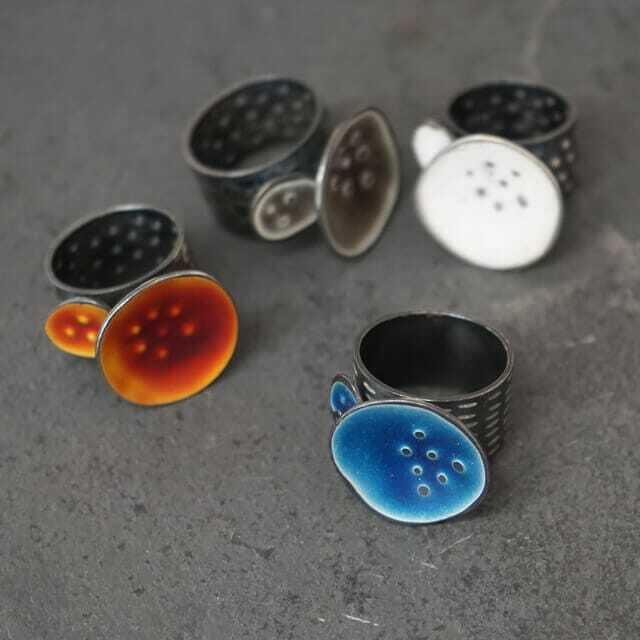 She works mainly in silver with enamel, using traditional silversmithing and jewellery craft skills. A few years ago she began experimenting with vitreous enamel, enjoying its spontaneity in comparison with the confines of working with traditional enamelling techniques. 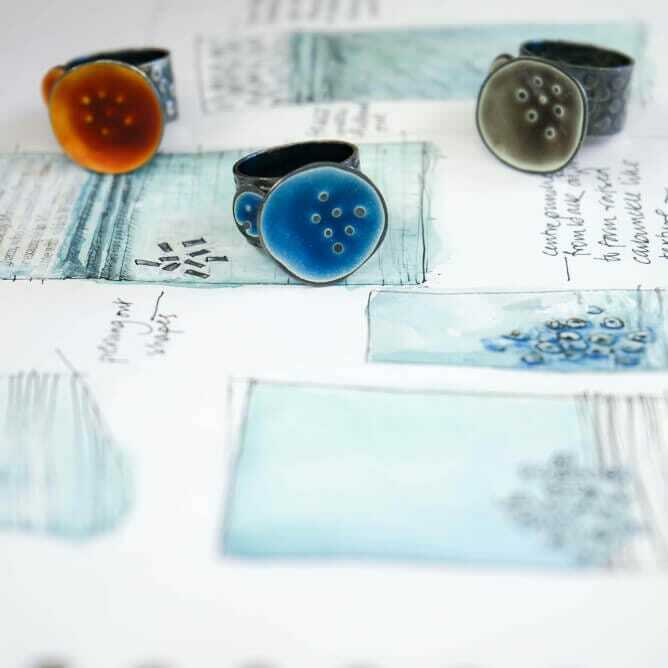 A nature aficionado, Caroline takes inspiration from her surroundings, particularly the textures, colours and patterns of the sea and coastline, and is intrigued by the symbiotic relationship of plants, creatures, the tide, seasons and life cycles. All of which feed into the creation of her contemporary and tactile jewellery, boxes and vessels.